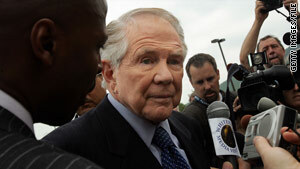 Pat Robertson has previously linked natural disasters and terrorist attacks to legalized abortion in the United States. (CNN) -- Pat Robertson, the evangelical Christian who once suggested God was punishing Americans with Hurricane Katrina, says a "pact to the devil" brought on the devastating earthquake in Haiti. Native Haitians defeated French colonists in 1804 and declared independence. "You know, the Haitians revolted and got themselves free. But ever since, they have been cursed by one thing after the other." Robertson has previously linked natural disasters and terrorist attacks to legalized abortion in the United States. Soon after Hurricane Katrina ravaged the Gulf Coast, killing more than 1,800 and wreaking unprecedented devastation on New Orleans, Louisiana, Robertson weighed in with his own theory. "We have killed over 40 million unborn babies in America," Robertson said on his September 12, 2005, broadcast of "700 Club." "I was reading, yesterday, a book that was very interesting about what God has to say in the Old Testament about those who shed innocent blood. And he [the author] used the term that those who do this, 'the land will vomit you out.' ... But have we found we are unable somehow to defend ourselves against some of the attacks that are coming against us, either by terrorists or now by natural disaster? Could they be connected in some way?"